The owners of a popular Wyre Forest nursing home have appointed a new manager who plans to maintain the home’s high quality care and forge closer links with the community. 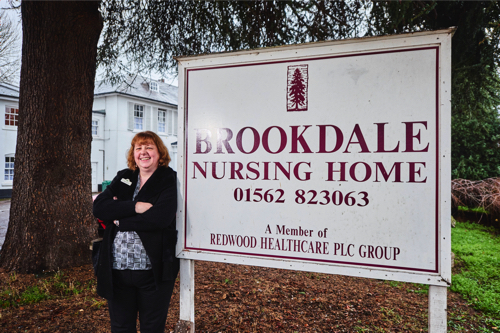 Experienced care specialist Jackie Huckvale, who has over 20 years’ experience in the care and nursing sector, has joined Kidderminster’s Brookdale Nursing Home. Jackie, who moves from Brookdale’s sister home near Telford, has already set about making changes which will make the Blakebrook-based home ‘the best it can possibly be’. Jackie said: “Care is all about quality and I am looking forward to delivering the best standards for our residents at Brookdale. “We have a first-class team who work so hard to make a difference every day here at Brookdale. It has such a homely feel and my aim is not only to maintain the high quality of care we provide, but to make further improvements and get the local community and families much more involved. Brookdale Nursing Home is part of the privately-owned Redwood Healthcare Group. It is registered with the Care Quality Commission to provide accommodation for 40 older people who require personal care. It is one of only a few nursing homes in Worcestershire to hold the Gold Standards Framework’s ‘Platinum’ status, which recognises how staff at the home consistently support residents who are nearing the end of their lives with the highest possible care.